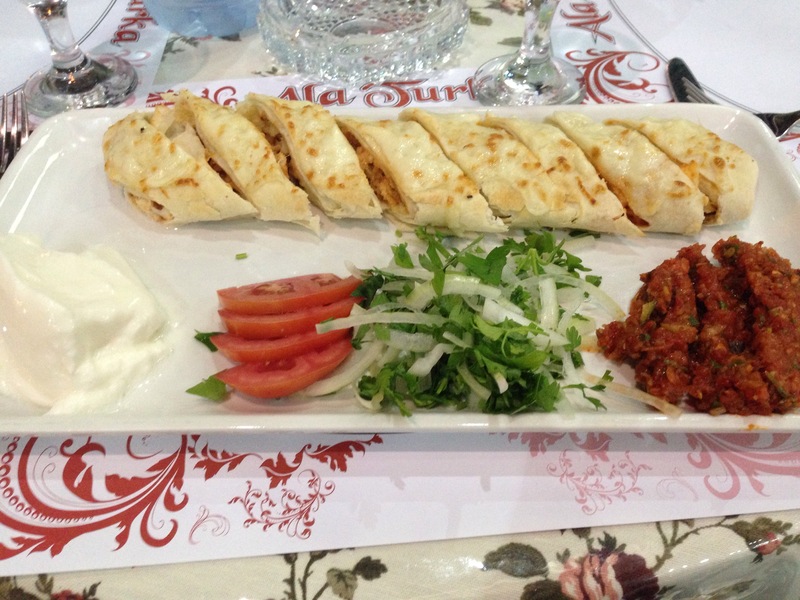 Turkish food is high on my list of favorite national cuisines. I am a sucker for mezze (small hot and cold appetizers, though I make meals out of them), but a good kabob or pide is a solid bet. Yet it took a trip to Oman to try a special kabob I’d yet to discover: The Iskender kabob. I grew up associating kabobs with meat on a stick (or skewer). My travels made me understand that kabobs take many forms. What I thought of as a kabob is a more specific form, the brochette. Kabobs can take many forms – whether cubes of meat are used, or whether they more resemble kofta (or kefte), made with ground meat -usually beef or lamb or a combination of the two. I had not experienced the Iskender kabob, which bears little resemblance to any of the above types of kabob. 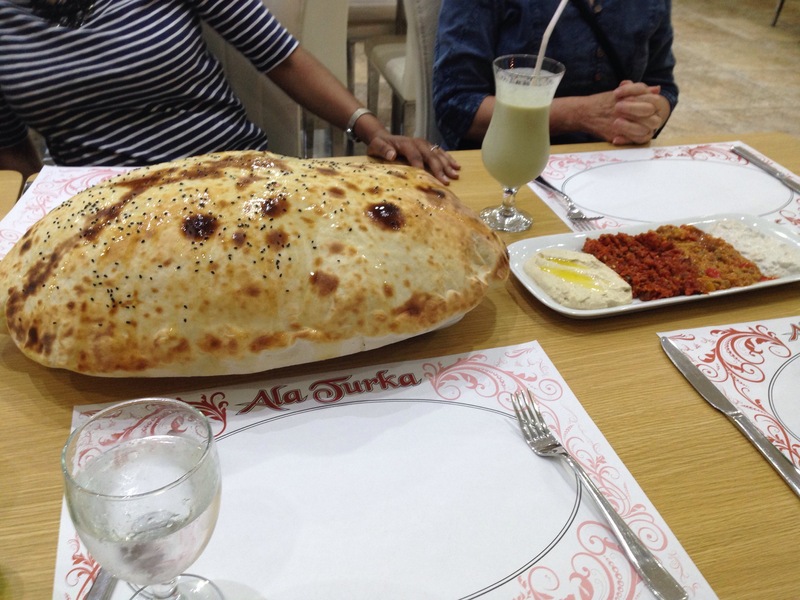 Enter Ala Turka, an unsassuming casual restaurant in the Jaharat al Shatti shopping center in a posh neighborhood of Oman’s capital, Oman. It’s not quite worthy to be labeled as a dive. Yet it’s certainly not high-end, either, with flowered plastic tablecloths and paper placemats, as well as the symbol of a local establishment in Oman – a box of facial tissues are your napkins. Those facial tissues should be the official Omani flower. It’s clearly a great choice of hand wipe when serving or eating messy food (eye roll). The Iskender kabob is not ubiquitous Turkish fare, but it clearly spread far from its origins in Bursa, a city in northwestern Turkey It is a decadent dish that seems part shawarma and part curry. Doner meat (shaved lamb, beef, or chicken, roasted on a vertical spit) combines toasted, fluffy pide bread. Smothered with a buttery tomato sauce, warm, strained yogurt tops it or is served on the side. It is typical to drizzle melted butter on the meat and bread during and after cooking. Personally, I can do without the butter, but the tomato-yogurt-meat-bread combination is filling, tangy and rich. It is a dish that combines such simple flavors but produces spectacular result. Lest I shortchange the rest of Ala Turka’s menu, their spiced Adana kabobs, Beyti kabobs (above; think of a kabob stromboli – meat, topped with cheese, wrapped in a flaky flatbread pastry and baked), and their mezze were good. While their mezze was not outstanding, the bread served with their mezze platter was great. I’ve had it before, but it’s not on every Turkish menu, so it’s worth mentioning. It resembles a giant, puffy football (above). Hot out of the oven, when one cuts into it, the steam releases and the football deflates, leaving a shell of bread, brushed with a hint of butter and black sesame seeds. Delicious on its own, it makes mezze more fabulous. Want to learn how to recreate the Iskender kabob in your own kitchen? Watch out for my next post, in which I’ll tell you how you can do it easily and still fit it into a healthy diet! BEST REAL TURKISH RESTAURANT IN MUSCAT OMAN.